AT LAST! 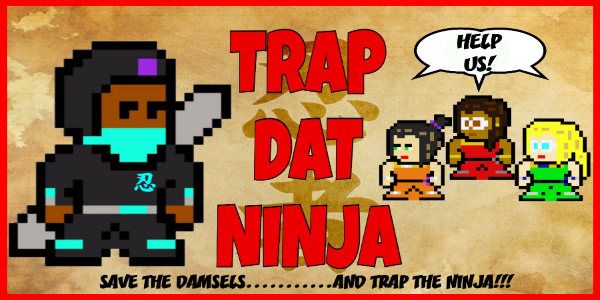 TRAP DAT NINJA IS OFFICIALLY HERE! 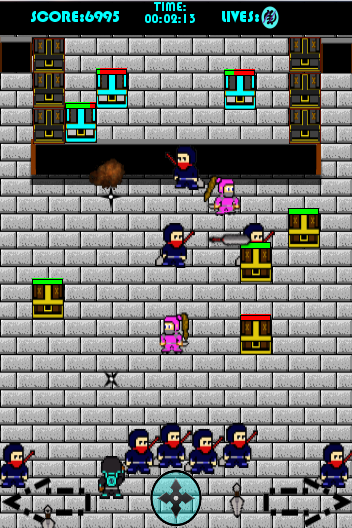 Play as Sky Nyame (pronounced N-YAH-MAY), a young upstart Ninja who is called upon to take on the notorious Ninja Posse, Led by the enigmatic, somewhat mysterious Mr.Shinobi! - Try Out The Free Demo! - Now Available on Android/Google Play App Market! Coming Soon To Apple/iTunes App Stores, Mac/Apple OS and other formats, so be on the Lookout! 11/11/15 1.00.1: First Official Release of the Full Version. - The Mute Button not working properly. It only 'Mutes' the game sounds (Music and F/X) and won't toggle On/Off for some reason. Currently working to fix it. - Misfires with the Main Character (Sky Nyame) 'Shoot' Button. Sometimes he just fires w/o shooting/throwing any Ninja Stars. But keep pressing/re-pressing the Button to get him to Fire again. - Share Your Score Buttons are not functioning as stated. Really intended for Mobile versions, but right now they will only redirect you to Trap Dat Ninja's Social Media sites. Will try to implement them for Desktop. 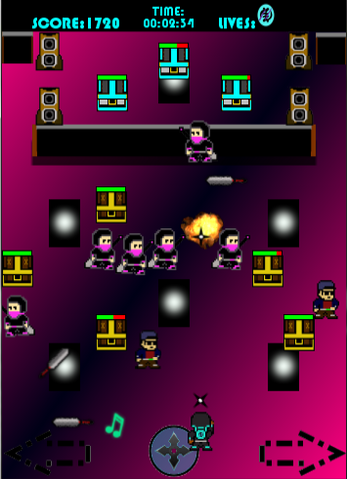 - Possible Updates (featuring Game Play tweaks, New Stages, New Characters) will be Coming Along on a Periodic Basis! Thanks for Trying/Buying/Playing TRAP DAT NINJA! Any questions, comments or if you find any Bugs/Errors in the Game, please email me or contact me at any of the Social Media Links above.